When we shared Greenlee’s Cinnamon Raisin Bread last month, a reader posted a comment requesting a recipe for Greenlee’s French toast that had been misplaced. I did a little online sleuthing, but couldn’t find a recipe that specifically called for Greenlee’s bread. So many fans of this delicious cinnamon raisin bread raved about using it in French toast that I just had to try it, so I started a recipe search. When the French toast recipe starts with a bread as sweet and rich as Greenlee’s, the batter should complement its flavor without adding too much additional sugar. The bread is also very moist, so keeping the slices intact during the battering and cooking process presented a challenge. An allrecipes selection, which I adapted slightly, seemed like a good option for a special Saturday morning breakfast. Place flour in a medium mixing bowl and slowly whisk in the milk. Add the other ingredients, except the bread, and whisk until blended and smooth. Heat a large skillet over medium heat with about a teaspoon of vegetable oil. Pour the batter in a 9″ x 13″ pan and soak 4 slices of bread for about 30 seconds on each side. (Note: the bread will be very soft, so handle carefully to avoid breaking the slices.) Place bread in hot skillet and cook until it is crisp and golden, then flip carefully and cook the second side. Repeat the battering and cooking process with the remaining bread, adding more oil to the skillet as necessary. This recipe obviously makes French toast for a crowd, so I made one-third of it for two people. If you are making the recipe as written, keep the toast warm in a 200° oven until you are ready to serve it. You can dust it with confectioner’s sugar or serve it with the syrup of your choice. I think this recipe really works with such a moist bread. The flour gives the batter a little body and crisps up the French toast nicely. Adding a little more cinnamon to the batter layers the flavor, and we thought it was fine without any additional sugar. Allen gave it his whole-hearted approval by telling me I could make Greenlee’s Cinnamon Raisin French Toast anytime! The BEST French Toast ever!!!!! So glad you enjoyed it, Lisa! 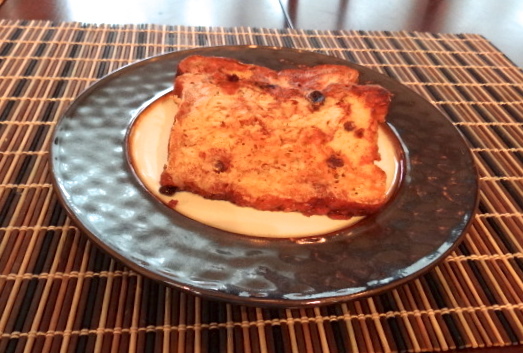 I’m looking for a recipe for baked french toast using the Greenlee’s Cinnamon Bread. Have your every tried anything like that? Hi! I haven’t tried a baked French toast recipe using Greenlee’s Cinnamon Bread, and I’m not sure how successful one might be since Greenlee’s is so incredibly moist. You might end up with French toast pudding! I’ve made baked French toast on several occasions, but with “sturdier” sourdough or French bread. A quick search of several recipe sites didn’t yield anything I feel comfortable in recommending to you. Thanks for reading!